Touristy Navy Pier on a drizzly Tuesday evening isn’t on the top of any Chicagoan’s destination list, but it should have been tonight for the opening of Cirque Shanghai’s new acrobatic show, Cloud 9. Wonder, beauty and raw skill wind together and explode on Navy Pier’s Pepsi Skyline Stage — a 1,500-seat, canopied, open-air theatre located next to the McFerris Wheel. A young cast of fearless performers races through 17 acts in a 1.5 hour dazzle-thon. 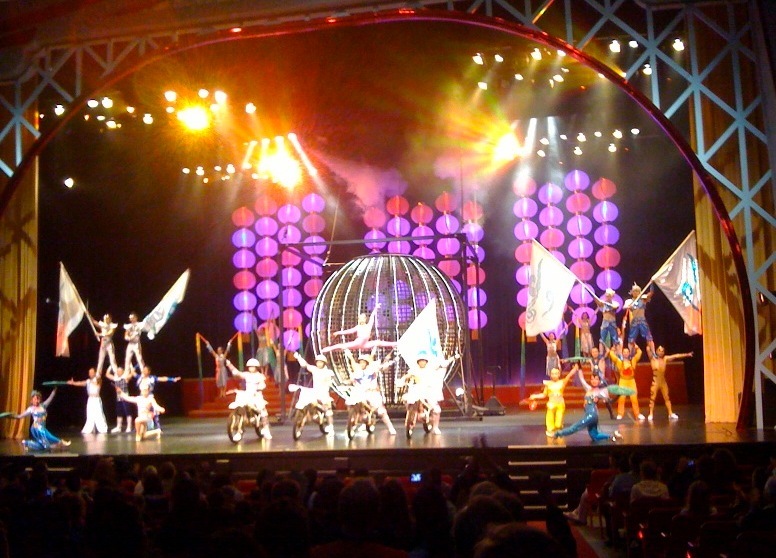 Men balance on the shoulders of men balancing on ladders, a unicyclist rides atop a spinning umbrella, a woman stacks several chairs up to the rafters, atop which she executes a victorious handstand. And for the heartstopping finale, a group of daredevil motorcyclists race around within an uncomfortably small steel globe (which dramatically drops from the sky). It’s amazing what these artists can do, and there’s not a lull to be found in the rapidly-paced staging. I think a few more performances under their belts will clean up some of the acts — particularly a mid-show hoop jumping routine that became less about breathless precision and more about the audience rooting them on to simply get through it as they kept knocking down the precariously-balanced hoops. Some hesitation and restarting of stunts also led to audience anxiety. There also seemed to be minor synchronization issues in the larger routines. But, please. It’s still an amazing evening — even if it’s not as polished as you think it could be. And at $19.50 a ticket for this family-friendly show, it’s a steal. So go already.